Rise Brewery takes pride in brewing beer which is so good that it will be a natural choice for you. Beer from Rise Brewery excels primarily by being brewed on pure raw materials. That is, when you experience notes of, for instance, liquorice, spices or citrus, it’s just good brewery craftsmanship and pure taste. When Rise’s brewery’s was resurrected, the logo with the little gray sparrow standing in front of the lion was conceived. They are derived from a limestone relief from Rise church. The gray sparrow, commonly called “grolle” on Ærø, is a kind of national bird, which the inhabitants like to call themselves. In addition, a twist is that Grolle was also the surname of the inventor (Josef Groll) of the first pilsner beer in the world. The Ærø series is the one we started with, and it is the one most love us for. The Ærø series includes: the Grolle pilsner, the Golden Pale Ale, the India Pale Ale, the Walnut Duke Hans no.5, the Dark Ale, the Stout, the Seaweed, the Easter Ale and the Strong Rudolph Christmas Ale. 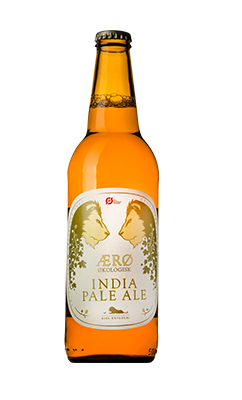 The Ærø India Pale Ale is an incredibly well balanced beer. It is brewed with water, Pale Ale barley malt, wheat flour, sugar, yeast and spiced with cascade hops. Our brewmaster has composed the ingredients so you get a powerful, aromatic, extra-hoppy and beautiful golden ale, which is bitter without touching the back of the tongue. The IPA is a classic sailing beer – brewed for the first time in England during the colonial era. The extra hops made it possible for the beer to keep the long voyage to India. Rumor has it that the English were so pleased with the IPA that they wouldn’t let it go, and it is now one of the most popular beers in England. Our IPA does a great job at quenching thirst in the heat, or after a well done job. But you can also safely pour it into the pan to steam mussels. As a whole, Ærø IPA works best with seafood; both in the preparation and with good food. 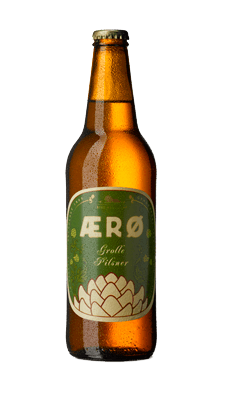 The Ærø Organic India Pale Ale is a refreshing and nuanced flavour experience. It is brewed with water, Pale Ale barley malt, yeast, sugar and hops (Tradition and Cascade). 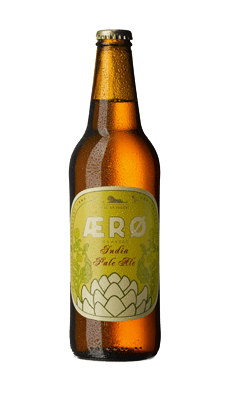 With the organic India Pale Ale you get an aromatic and hopped ale with a fine-tuned aftertaste. Our Ærø Organic IPA is a real thirst quencher; good for summer “hygge”, gardening – or as a welcome drink with salty snacks. Here you can also safely use a dash of it in cooking; when you cook in the oven, steam or poach. Best for white meat and fish. The Ærø Duke Hans no. 5 is incredibly popular. It is brewed with water, Pilsner barley malt, caramel barley malt, roasted barley malt, wheat flour, yeast, sugar and spiced with the flavor of Goldings. Walnut flavors have been added after fermentation. This good “Bock” beer is low-foaming and malted with a good hops bitterness, complemented by the sweet walnut flavor. These provide for very nice and rounded beer which appeals to both serious beer connoisseurs and laymen. This walnut beer is good for many purposes; many like it for everything. Not least at the luncheon table and with a good snaps. We recommend it the most as a welcome drink, or as a beer you enjoy for occasions that don’t involve heavy food. 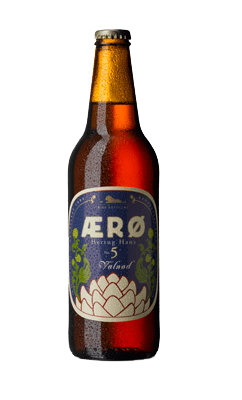 The fine, round walnut flavor is said to be enjoyable with a piece of good dark chocolate – and it’s probably not a coincidence that Ærø’s ice cream maker Aroma Is has made an incredibly popular ice cream with our walnut beer. The Ærø Organic Walnut has a lovely aromatic scent of walnut and a balanced aftertaste of the ilk. 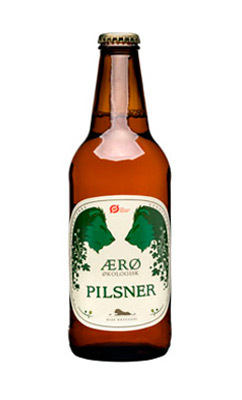 It is brewed with water, Pilsner barley malt, caramel barley malt, roasted barley malt, wheat flour, sugar, yeast, hops (Emerald) and natural walnut flavors. We have created a harmonious, reddish brown and heavily fermented “Bock” beer which delivers a delicate sweetness and roundness. Therefore, this beer is the favorite beer of many. The beer is suitable for the cheese table as well as a welcome drink, and for many the good, almost creamy walnut flavor goes down well on its own. It is therefore proper to stick in in your basket instead of a bottle of wine if you are out to enjoy the summer evening with someone you really love. Ærø Dark Ale is loved by many. Partly for its beautiful glow when it is poured into the glass and partly because it is a particularly well-brewed beer, with exciting and balanced flavors of, among other things, liquorice and fruit. We are talking of a phenomenal brewing masterpiece – no added taste. It is brewed on water, Pale Ale barley malt, caramel barley malt, roasted barley flour, yeast, sugar and spiced with First Gold and Cascade hops. You can’t beat an Ærø Dark Ale if you want to try a beer with natural and nuanced flavors. The Ærø Dark Ale ought not to be too cold and we recommend a serving temperature of approx. 12 degrees celcius. We will not blame you if you serve Ærø Dark Ale for a good dinner – but it’s a beer full of character that likes to be in the centre. That’s why it’s best enjoyed with dishes which are not too spicy, such as fried pork with parsley sauce, skipperlabskovs (a kind of sailor’s meat hash) or a good stew. Ærø Organic Dark Ale is a delight for the eye and the palate. The deep mahogany red colour is derived from the good combination of malts. It is brewed with water, Pale Ale barley malt, caramel barley malt, roasted barley malt, yeast, sugar and spiced with Tradition and Emerald hops. The taste is very rich and complex: first malted with a touch of licorice, followed by an aromatic, fruity, bitter aftertaste. 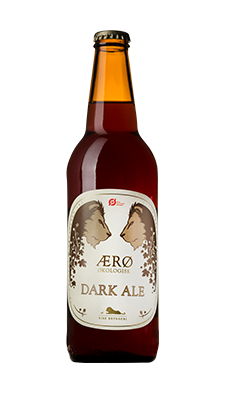 Ærø Organic Dark Ale must be enjoyed cellar chilled and as a preferred sunset drink, so you can experience the color scheme in the beer when you hold the glass against the light. 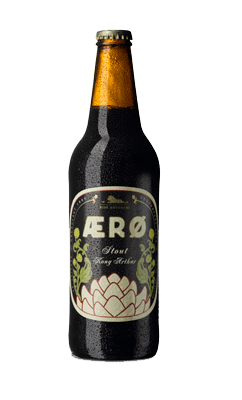 If you are grabbed by a crazy home baker, we strongly recommend that you add a good dash of Ærø Organic Dark Ale into your bread dough. It gives a deep, grounded juicyness which is quite unique. The Ærø Christmas Ale “Strong Rudolph” is a classic among Christmas beers. Despite its relatively high alcoholic strength, the taste is free from the fragrance that often affects alcoholic Christmas beers. It is brewed with water, Pale Ale barley malt, wheat flour, roasted barley malt, caramel barley malt, yeast, sugar and spiced with E.K Golding hops and English First Gold hops added during a two-stage boiling process. This combination results in a Christmas ale with lots of character, high occasion mood and full of taste – without artifice. “Strong Rudolph” is beautiful and dark red in the glass, creating a mood and a Christmas joy to almost any occasion. Do not cheat yourself and your favorite people from a tasting which gives red cheeks, prompts Christmas lights and a broad smile. 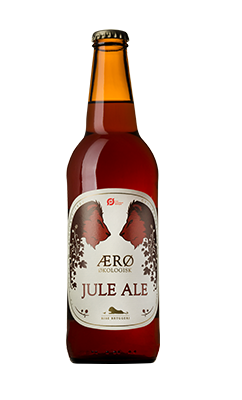 Ærø Organic Jule Ale is a lovely and tasty Christmas beer where its sense of festive spice comes from the combination of malt and hops. It is brewed with water, Pale Ale barley malt, wheat flour, roasted barley malt, caramel barley malt, yeast and sugar and spiced with Tradition and emerald hops. If you hold the beer against the light, you will see that the color is deep dark red. Our brewmaster has created a strong but not bitter ale, without adding the usual Christmas and mulling spices, which are otherwise seen in Christmas beer. It yields a beer which pure in taste, and which excites and satisfies the taste buds without dumbing them. Naturally, this award-winning organic Christmas ale belongs to the Christmas lunch table, where – thanks to its pure taste – it plays beautifully with a wide range of foods; from herring and fried fish to full-bodied meat dishes, both cold and lukewarm slices. Like with our Ærø Easter Ale, you can enjoy Ærø Christmas Ale all year long as an all-round beer with good food. The Golden Pale Ale once emerged as the drying of malt using coke made the process easier to control. One could then make a lighter and milder beer that was applicable to all types of food. It is brewed with water, Pale Ale barley malt, wheat flour, yeast and hops. The only difference there is between Ærø Gylden and Ærø IPA is the addition of Cascade hops in the IPA. Golden Pale Ale is a light but tasteful ale of just 4.2%. It is great for a summer lunch in the garden, or as a thirst quencher on hot days. The fine taste and relatively low alcohol content means that most lunch dishes are suited to this beer. It’s not the alcohol percentage in this beer you’ll need if you’re looking for an excuse to grab an afternoon nap after lunch. 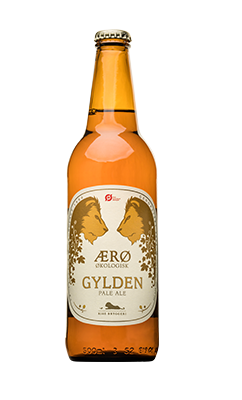 Ærø Organic Golden is a lovely light and simple spring and summer beer. 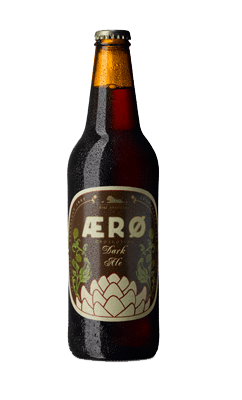 It is brewed with water, Pale Ale barley malt, a little caramel barley malt, wheat flour and yeast – spiced with Emerald hops. The Ærø Stout – also called the house’s cold coffee. 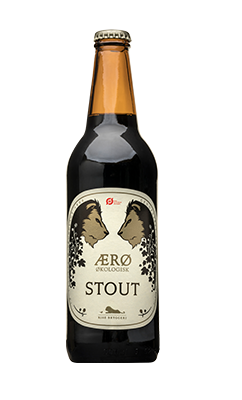 Ærø Stout is brewed with water, Pale Ale barley malt, roasted barley malt, wheat flour, yeast and sugar. The hops used are English first gold and Goldings. King Arthur was originally created on the occasion of Søby Wharf’s 75th anniversary in 2006. Ærø’s largest workplace, its founder was called Arthur Jørgensen, and his nickname “King Arthur”. Ærø Stout is a small piece of art and should be enjoyed with great thought. 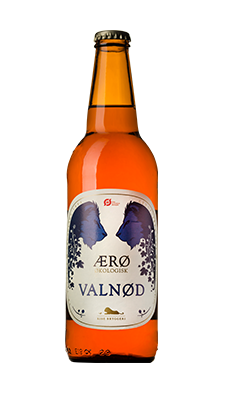 We recommend sipping it while you cook or read a good book with a good Ærø Cigar. The taste experience is filled with roasted malt and exciting undertones of coffee and liquorice. The hoppy aroma is just as good – a real “dry-stout”. Ærø Økologisk Stout er en dejlig mild Stout – nærmere betegnet – en begynder Stout. Den er brygget på vand, pale ale bygmalt, karamel bygmalt, ristet bygmalt, hvedemalt, sukker og gær – krydret med Smaragd og Tradition humle. 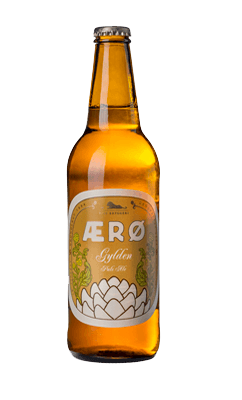 The Ærø Easter Ale is, according to the enthusiastic critic of Jylland Posten, a “Danish beer, which is close to a quintessentially English bitter, that is, a fermented beer, which a bartender typically pumps into the pint glass in an English pub.” Ærø Easter Ale is brewed with water, Pale Ale barley malt, crystallized barley malt, roasted barley malt, wheat flour, yeast, sugar. Golding hops are added during two-stage boiling and the yeast used completes this traditionally brewed Easter Ale. It yields a beautiful, deep brown colour and hits home like a good hoppy and aromatic beer with a rich, soft and round flavor and good aroma – not too bitter – hoppy character. The taste also has notes of the smoke from the Easter bonfires on the beach. Ærø Easter Ale can in principle be enjoyed all year round. But it makes sense if you put it on a well-decked Easter table of the cold kind. On Ærø we have the tradition of boiling eggs in seawater and roasting sausages over bonfires lit on the beaches of the island; regardless of whether the Easter weather is mild or harsh. Here an Easter Ale tastes extra good and it’s the pure, uncut truth. 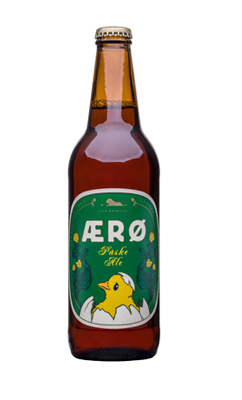 The Ærø Organic Easter Ale is an easy one to go to without being simple or unexpected. It is brewed with water, Pale Ale barley malt, caramel barley malt, roasted barley malt, wheat flour, yeast and sugar spiced with Emerald hops added during the two-stage boiling. With Ærø Organic Easter Ale, we’ve created a beautiful, deep-drawn beer which tastefully lands in the hoppy and full-bodied, with a good, round-bodied flavor which fits well with the hops bitterness. We like to drink the organic Easter Ale for Easter. But that’s probably because Easter on Ærø is something special: the outdoor experience of Easter can range from snow and strong wind to mild spring sun; but always with bonfires, sausages, boiled eggs, high spirits and cold Easter beer. 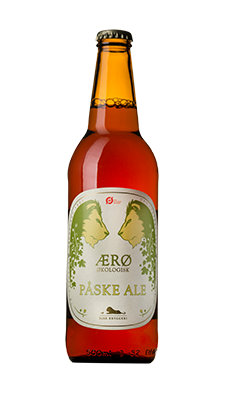 The Easter table on Ærø includes everything, from herring to seafood and lamb roast, and here the organic Easter Ale finds itself at ease over a broad range. 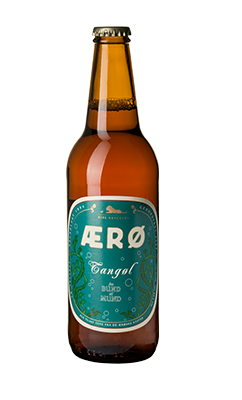 The Ærø Tangøl is a fresh light Pale Ale, which is brewed with bladderwrack seaweed from Danmark’s coasts. It is brewed with water, Pale Ale barley malt, caramel malt, rye flour, wheat flour, oats, yeast and whole 4 hops Cascade, Chinook, Simcoe and Amarillo hops. The seaweed adds to the beer a tinge of salt to the taste. In spite of a very strong hoppy bite, which gives the beer a bitter character, it is still fresh along with citrus notes from the Cascade hump. The color is beautiful yellow and golden and with a light and airy white foam on top. The idea for the seaweed came from the association Bund to Mund, which together with Bo Rino Christiansen from Kunstbryggeriet Far & Søn developed the recipe. Bund to Mund Underwater Festival puts in focus nature and good and local ingredients. Enjoy it with a sea view – when the boat rolling quietly in the harbor, or with the feet in the hot sand on the beach, where a fresh breeze draws the sea air on a hot summer day – the beer is a thirst quencher which can be enjoyed with a little of everything for a good lunch, for a snack or simply by itself.